HandKrafted by Stephanie: Mojo You Make Me Smile & Exciting News! Mojo You Make Me Smile & Exciting News! Hello! Today I have a card to share that uses this week's new Mojo Monday sketch (#174). It is also my first week as one of the Mojo Makers! Yep, that's my exciting news! Julee invited me to join the team, and of course I said YES! Also joining the team is Debbie Carriere! Some of you may have seen the announcement on the Mojo Monday blog yesterday.. thank you SO much for those of you who sent me emails and left such sweet comments for me! I put this card all together and had everything but the sentiment panel. You see, I was patiently waiting for the mail to arrive with my new Verve stamps! As soon as I came home from picking Sabrina up from school, I pulled out the new Love Notes set and the Jotted Heart Die and sat down to finish my card. I stamped the heart, die cut it, stamped the sentiment and popped it on top of my vellum rosette. For a little added "oomph", I added some glitter to the edges of my heart. Paper: KP Valentine (K & Company), Classic Crest Classic Natural White (Neenah), Pure Poppy (Papertrey Ink), Pink vellum (CTMH). Accessories: Jotted Heart Die (A Cut Above Dies by Verve), Rosette Die (MFT), Tiny Hearts border punch, Garnet glitter (Martha Stewart); Ribbon (May Arts), Felt heart (American Crafts), Heart rhinestone (Pizazz Aplenty), Heart trinket pins (Maya Road), Foam tape, Thread, Sewing machine. CONGRATS on making the Mojo team!!! Very adorable card! Congratulations, Steph!! You're a perfect addition!! LOVE your beautiful card!! Stephanie - this is just fabulous! I love the vellum rosette and the sweet heart. Fab!! Congrats girlll i am happy with you...Your work is beautiful...Love it! this is gorgeous Stephanie, welcome girl, we are so glad to have you on the mojo team...woohoo....have a fantastic week! 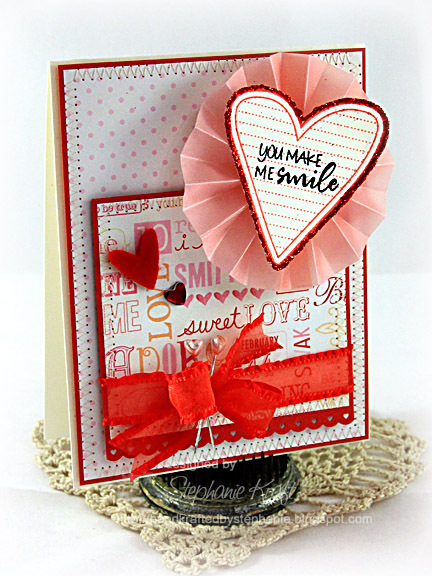 Your card makes me smile! Yahooo Stephanie! So happy to see you join the MOJO DT! You always do an amazing job with their sketches and you showcase those Verve stamps like no other! :) Well deserved! This is one beautiful card. Just beautiful. Thanks for the challenge. Congratulations, Stephanie!!! What a great DT to be on. They are lucky to have you!!! Your card is fab! Congrats!!!! Playing along with the Mojo sketch to celebrate your new DT! :) Beautiful card!